Denmark’s Mathias Bay-Smidt / Rikke Søby took the Swiss Open title on Sunday in the first major final for either member of this new pair. 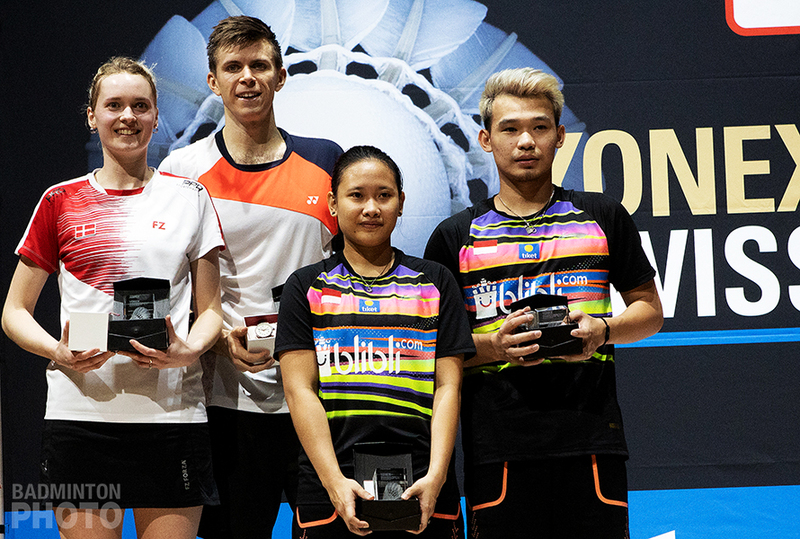 The 2019 Swiss Open was almost an anniversary for Mathias Bay-Smidt and Rikke Søby (pictured top). Last year’s outing in Basel was the first tournament for this new Danish pair. It was also the first of a few inauspicious first round exits, after which they went on a run to the semis in last autumn’s Dutch Open. But that bit of success in Almere in October didn’t have anyone tipping them for the winners in Switzerland on Sunday. 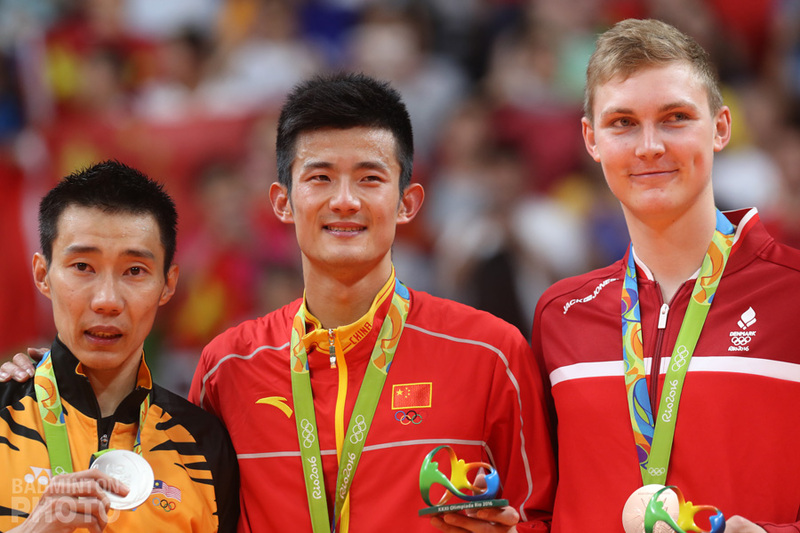 The big hint of what was to came was given on Saturday, when the Danes ousted former All England champion Lu Kai. They rushed out to an incredible start against Lu and partner Chen Lu, then wavered, but won that semi-final in three games. On Sunday, they took their first game against Rinov Rivaldy / Pitha Haningtyas Mentari (pictured right, with Bay-Smidt/Søby) but then allowed the Indonesian teenagers to run away with the second game. The Europeans stepped up their game in the decider but still nearly blew a 10-4 lead. 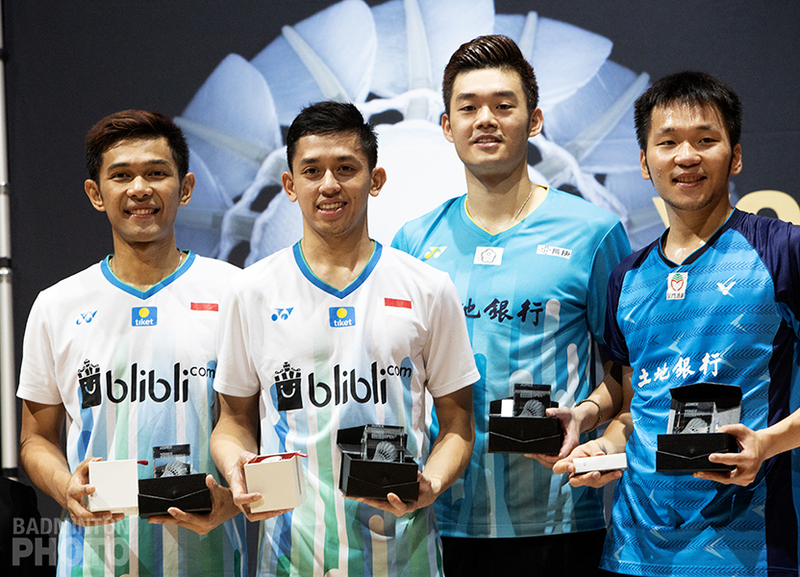 They finally regrouped and prevented the Indonesia Super 100 winners from catching up. The victory for Bay-Smidt and Søby came just days after former world #1 Christinna Pedersen joined her partner Kamilla Rytter Juhl in retirement from international badminton. Pedersen and Mathias Christiansen were until recently only one of two European pairs in the world’s mixed doubles top ten. The new Swiss Open champions are currently ranked #95 in the world but should ascend to the top 60 by tomorrow. 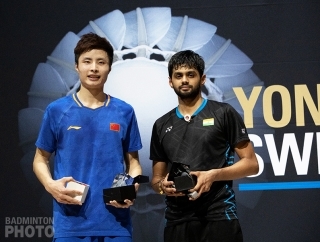 By the time Shi Yuqi had claimed the men’s singles title in Basel, outlasting India’s Sai Praneeth (pictured left) in their deciding game, both China and Korea had titled at either end of the Eurasian landmass. 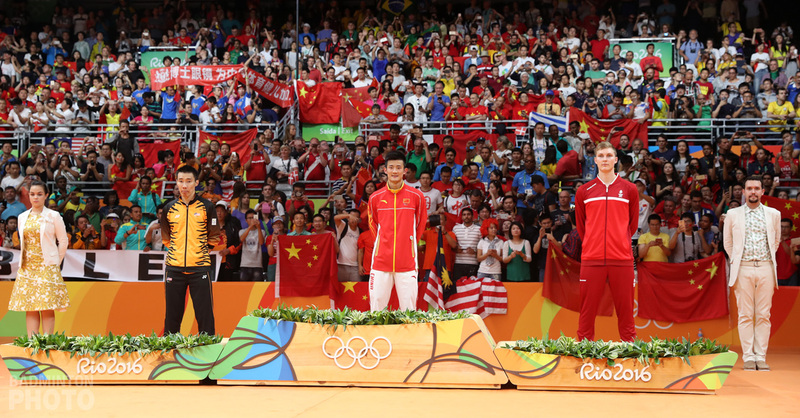 Earlier in the day, Shi’s compatriot Weng Hongyang had won the men’s singles title at the Lingshui China Masters to become only the fourth teenager to win a major title since Lin Dan and Sony Dwi Kuncoro did so back in the autumn of 2003. Nor was China the only team earning such a distinction. 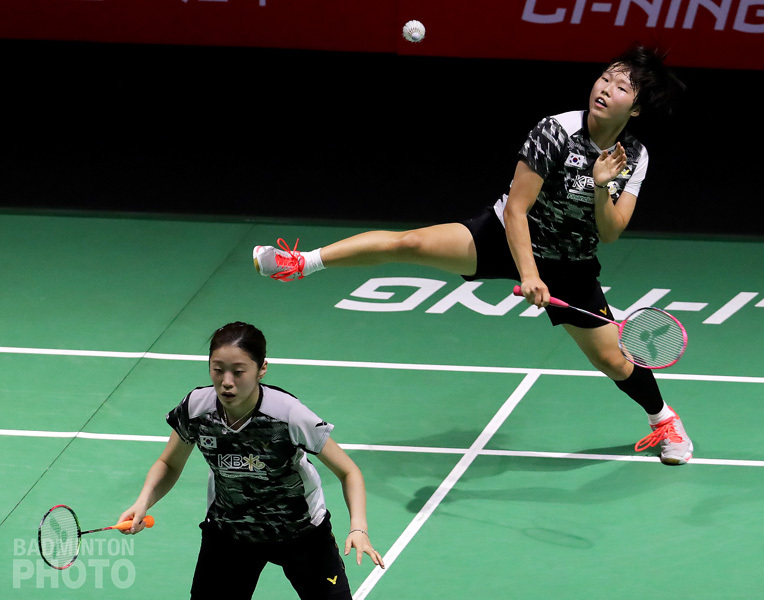 In women’s doubles, Korea came out on top in both Basel and Lingshui. First, teenager Baek Ha Na claimed her first major senior title, as did her partner Kim Hye Rin (pictured right). 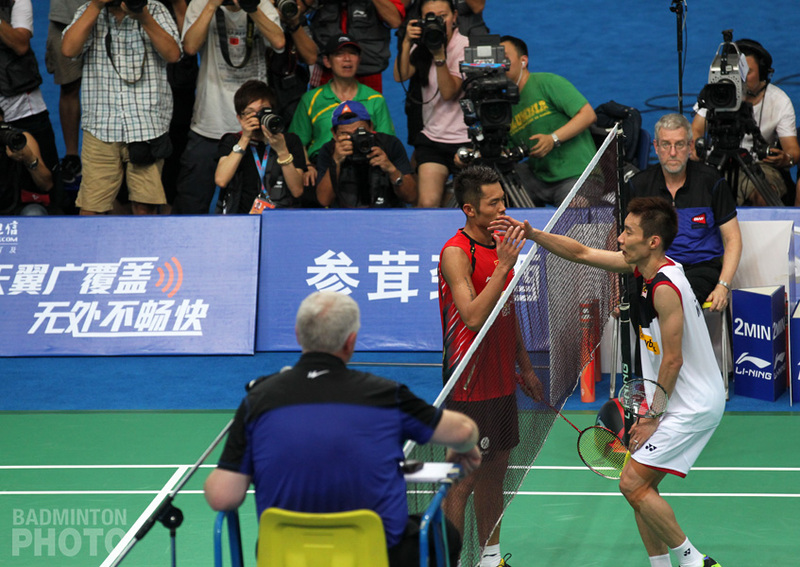 They beat Baek’s successors as World Junior Champions, China’s Liu Xuanxuan and Xia Yuting in three tough games. Then a few hours later in the Swiss Open, Korean veterans Chang Ye Na and Jung Kyung Eun beat Chinese Taipei Open winners Nami Matsuyama / Chiharu Shida in straight games. Incidentally, Matsuyama was also Baek’s predecessor as World Junior Champion in girls’ doubles, having won that title in 2016. Chang Ye Na and Jung Kyung Eun (pictured left) got back on the top of the podium recently, at the Korea Masters late last year, but it was the first title away from home in over 3 years for Jung, while Chang had last titled overseas two years ago. Meanwhile, Jung Kyung Eun was the only repeat champion at the Swiss Open. She had won back in 2013 with Kim Ha Na. This title will leave Chang and Jung just shy of entering the world’s top ten. Each of them have been ranked as high as #2 in the world but they have yet to make it higher than 14th as a pair. Immediately after 2017 All England champion Chang Ye Na and 2018 winner in Birmingham Shi Yuqi had mounted the podium, it was finally the turn of a reigning All England winner to enjoy some prompt follow-up success. 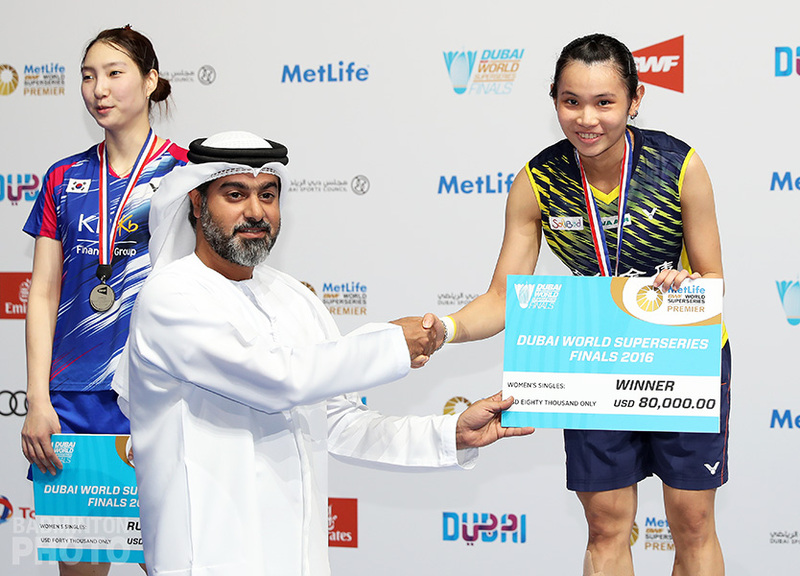 China’s Chen Yufei (pictured), winner last week of the biggest title of her career, capped it off with a quick victory over Saena Kawakami of Japan. 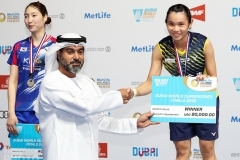 Chen Yufei only recently snapped a two-year title drought but now she is clearly on a roll, with three titles in just over 4 months, including a Super 750, a Super 1000, and now a Super 300 for good measure. She has also climbed to #2 in the world rankings for the first time in her career. The afternoon in Basel ended in disappointment for the new pairing of Lee Yang and Wang Chi Lin. The Spain Masters winners looked very impressive in the run-up to what was their second final in the first four tournaments of their partnership. 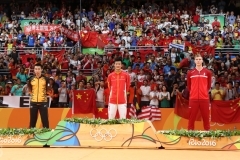 Like Shi Yuqi and Chang/Jung, they came into the final knowing that their compatriots had won in the same discipline in Lingshui a few hours earlier. In fact, for Lee, it was his longtime partner Lee Jhe Huei who had taken that Super 100 title with his new partner. There was no getting past the relentless assault from Indonesia’s Fajar Alfian / Muhammad Rian Ardianto (pictured), however. The Asian Games silver medallists played with power and energy and ran away with the second game. With the Swiss Open concluded, that leaves just one more event in the 5-week-long European leg of the BWF World Tour. Interestingly, only three runners-up Lee/Wang are heading to the Orleans Masters. The men’s doubles winners are on their way to Hong Kong, where they will be the only Swiss Open finalists at the Asian Mixed Team Championships. The singles winners have a break until the India Open and several others will not be back on court until the Malaysia Super 750.